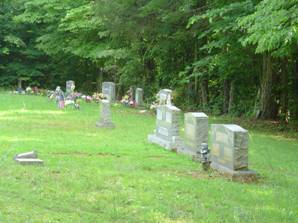 The Bawcom Cemetery lies in the Beech Creek area of Wayne Co. The cemetery also has various spellings of the name. Spellings include “Bawcom”, “Balcom”, & “Baucham”. To reach the cemetery, travel north from the courthouse square in Waynesboro on Highway 13N. Turn left onto highway 228 (Beech Creek Rd.). Travel 2.9 miles and turn left crossing the Colvert Holt Memorial bridge. Turn right at the stop sign and proceed past the Old Union Church. Turn right at the next stop sign & travel .8 mile to the cemetery. This is a very narrow road with hills & curves. 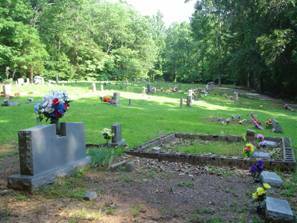 This cemetery has several graves marked only with fieldstones with no information. Some of these may be the reason for the cemetery name. Davis, D.C.; b. 29 Oct 1902, d. 22 Dec 1904, son of W.D. & M.E. Davis, James M.; b. 26 Jun 1895, d. 15 May 1928, son of C.K. & S.A.
Davis, L.M. ; b. 28 Sep 1899, d. 06 Mar 1901, son of W.R.
Davis, N.A. ; b. 03 Jan 1849, d. 20 Oct 1900, daughter of J.B. & E.
Davis, R.O. ; b. 20 Aug 1893, d. 30 May 1897, son of W.R.
Davis, Sarah A.; b. 15 Sep 1874, d. 02 Jun 1940, wife of C.K. Davis, William H.; b. 12 Oct 1892, d. 18 Sep 1913, son of C.K. & S.A., husband of M.A. Groom, Emma M.; b. 15 Aug 1902, d. 29 Aug 1908, daughter of L.T. & A.F. Groom, Ernest T.; b. 02 Jan 1916, d. 30 Jul 1926, son of L.T. & A.F. Groom, Gracy; b. 19 Mar 1904, d. 22 Mar 1905, daughter of L.T. & A.F. Holt, infant girl; b. & d. 06 Mar 1940, daughter of G.E. & V.V. Worley, Mary J.; b. 01 Jan 1882, d. 06 Sep 1922, wife of B.A.